The Mando Method Podcast co-hosts Armand Rosamilia and Chuck Buda have a timely chat about paperbacks: sizing, pricing and which paper to use. Timely because the morning after they recorded this episode the Createspace/KDP announcement was made. Ignore the part in the episode where The Mando Method Podcast co-hosts Armand Rosamilia and Chuck Buda swear this is Chuck's Mailbag Eleven. Instead, they delve into two listener questions in episode X. Recorded in front of a rousing studio audience, The Mando Method Podcast co-hosts Armand Rosamilia and Chuck Buda chat about story structure and getting through the acts of a story. But that's not all, as the crowd itself offers their own opinions, too! The Mando Method Podcast: Episode 100 - Episode 100! 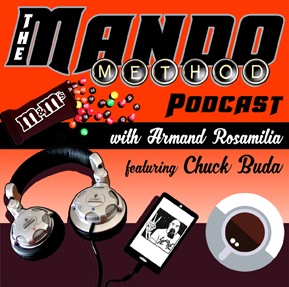 The Mando Method Podcast co-hosts Armand Rosamilia and Chuck Buda have reached a milestone. So to celebrate they say stupid things, laugh at their own jokes and make fools of themselves. Like the previous 99 episodes. Also, Chuck has some Top 10 List fodder to share.